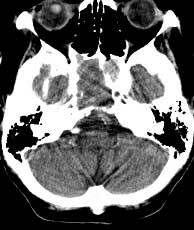 Findings: Expansile mass (a) involving the clivus and extending superiorly into the sphenoid sinus. 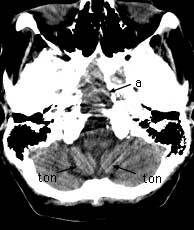 Cerebellar tonsils (ton). 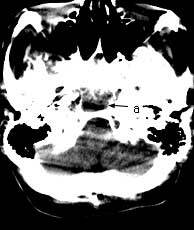 Left vertebral artery (vert) with calcifications along the medial aspect. Calcified choroid plexus within the foramina of Luschka (Lus). Cisterna magna (cm).